This page will be updated accordingly, it is currently very slim just to provide the overview description of git based distribution. ADM uses very simple git-based distribution structure. It takes full advantage of git submodules to provide the reusability and modular use of the higher level abstractions. 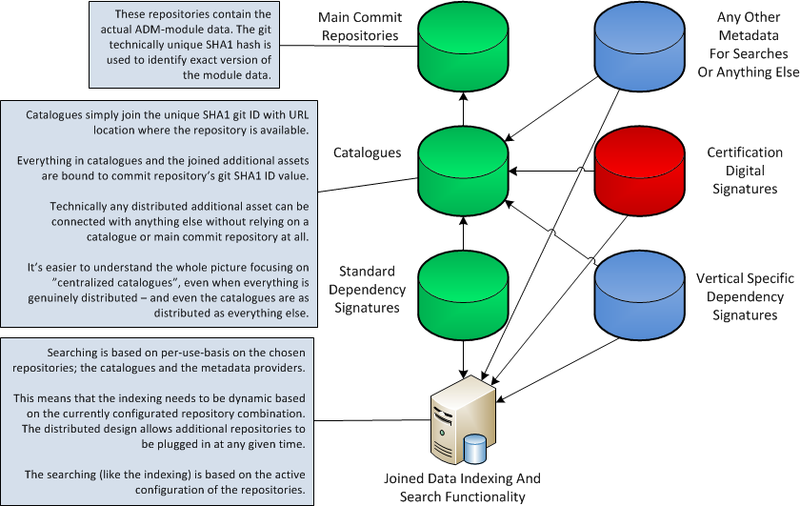 Git is simply used as a distributed database for storing any related metadata joined with git commit-level-unique SHA1 checksum. All the metadata repositories are independent git repositories having files pointing to the main ADM-module repository commit SHA1 ID. The community git repository providers are used as central hubs to get started. These are by no means necessary, but still provide a very convinient way for open-source communities to start forking off their reusable modifications. Currently the github.com repositories are more maintained, however we are going to synchronize gitorious.org in line with github and keep it updated. The initialization structures are currently based on Windows version of git, but the seasoned git users should get the grip pretty fast even though the examples are on Windows .cmd command files. The initialization currently apply only to Visual Studio and MonoDevelop project structure, but once the Eclipse support is finished, those will be changed accordingly.